dislikes stopthedrugwar! bunch of f'in idiots are gonna get high no matter what...quit diggin' in my pockets!!!! We welcome dissenting views, but your point is lost when you resort to name calling and accusing us of committing crimes against you. I am personally not an idiot. I am an Application programmer making 300K+ a year, and I vaporize my cannabis 2-4 times a week to relax. No hangover or porcelain god worshipping in the morning if I over indulge either. Drug war prohibition laws are an infringement on my personal civil rights. Therefore, I ignore them, and in doing so, harm absolutely nobody. This is spam. We get this crap in our daily online newspaper daily. our moron-fool leaders have been outed by Assange. incredibly however, that doesn't make them to look in the mirror. the ONLY thing that will put the brakes on their stupidity is when they run out tax dollar funding. if they ran a business like they run our country, they'd have gone bankrupt in the first month. "conservatives" they are NOT. Jeffrey Tucker has other articles relating to Sudafed restrictions. If interested, check out www.mises.org and go to author archives. Nice article. In the future if you could clearly state which politician is pushing the new legislation, I would greatly appreciate it. I am a registered voter and a Pseudoephedrine user, I will be writing a letter to the appropriate party. My brother-in-law recently received a summons in which they stated that he bought too much Sudafed. This is absolutely ridiculous. My brother-in-law has never had drug charges in his life. He is the sole provider for his family in which he has an autistic son. It just so happens that both his wife and daughter have sinus problems. His wife of course lives with him and his daughter is down at DePauw University, so he had to buy enough for both of them. I am so mad, I could just spit. When he went to his court date, the judge (who previously tried to commit suicide by blowing out her brains) would not let him talk to the prosecutor without a lawyer to which, I may add, he cannot afford. To top this all off, they are currently trying to find another home as the home they are currently renting is going up for sale and the place where he works may be going out on strike. The moronic cop who pressed charges against him should have at least asked him what was going on and once the cop checked the computer for any previous drug charges and saw that there were none, should have given him the benefit of the doubt. My god, what is happening to this country? If my brother-in-law goes to jail, he will most likely lose everything he has. There has to be a way for innocent people to protect themselves. It should have never even gotten this far to begin with. Once again, I am so mad, I could just spit!!!!! My husband is an allergy sufferer and uses Sudafed, moderately, I might add, to help. He tried to buy some today at a Wal-Mart in Conway, AR and was told he had to have a prescription. The lady said it had been in 'effect' since July 2011. In searching the AR Pharmacy Board website, we found out this is not a law. A state legislator tried to get it into law, but it was never voted on. Now Wal-Mat in this state has evidently decided to make their own laws. We moved here 18 months ago and have been appalled at the level of poverty, crime and underemployment in the state, but this is by far the worst thing we have encountered to date. I discovered this today--that as of July 27, 2011, Wal-mart will not sell Sudafed (or the generic equivalent) in the State of Arkansas without a prescription. There is no law on the book in Arkansas that mandates this. It appears that Wal-mart took this "initiative" themselves. As a retailer, they can decided which products they will and will not sell. But how can they require a medical doctor's prescription before they will sell me Sudafed, which is legal for me to buy without a prescription? What is next? I'll need a prescription to purchase tobacco? beer? wine? These are all substances that have government controls in place. Why not require prescriptions for these as well? Due to this travesty, I have decided not to do any further business with Wal-mart. There are alternatives--even here in Arkansas. 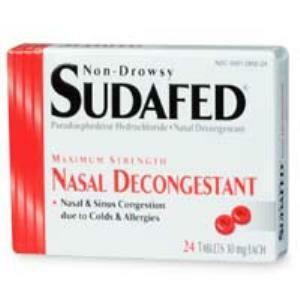 Please post where people can buy sudafed. I have so much pressure built up, I cannot stand it. I have to get my prescriptions by mail and Walgreens wont sell the sudafed to me because I dont get my prescriptions at their pharmacy. I do go in that Walgreens at least a few times a month to buy other items- not anymore! This whole limit is so ridiculous to begin with! Is there something wrong with COMMON SENSE? If some idiot comes to the checkout with a 100 boxes of pseudoephedrine then, um, maybe the store shouldn't sell it to them. I have to take these pills to make it through the day during allergy season. So does my child. Unfortunately, due to these stupid laws, I cannot purchase enough quantity for both myself and my kid at one time (a month's supply of pills and infant drops - are ya kiddin' me?!?). If you are stupid enough to do meth than you deserve what you get. It's called natural selection....why should we all suffer for the stupidity of a select few??? What happened to personal responsibility????? ?